Germans think it’s a good idea to let people shoot fake guns after consuming large quantities of alcohol. 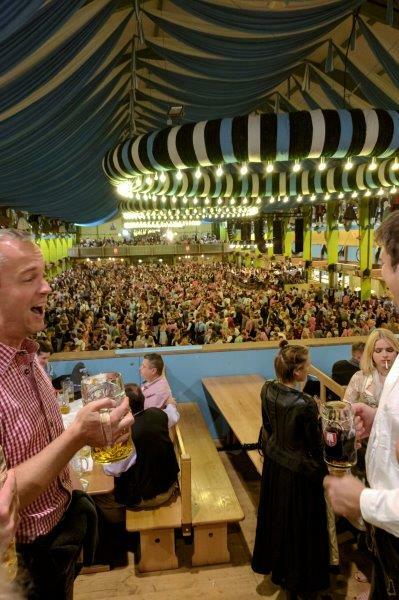 This is Mark’s version of Oktoberfest – I haven’t read Susan’s account. This will be fun to see how we match up on our stories! Most of the names have been changed to protect the innocent. 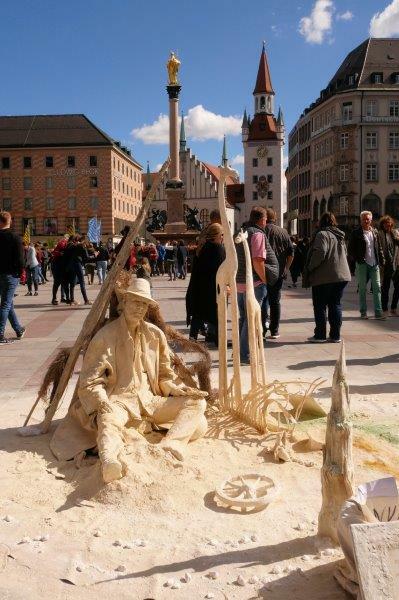 I knew this day wouldn’t be like any other day in Munich – it was sunny! We had pretty much a week of cold and damp weather before Thursday when our Oktoberfest reservations rolled around. 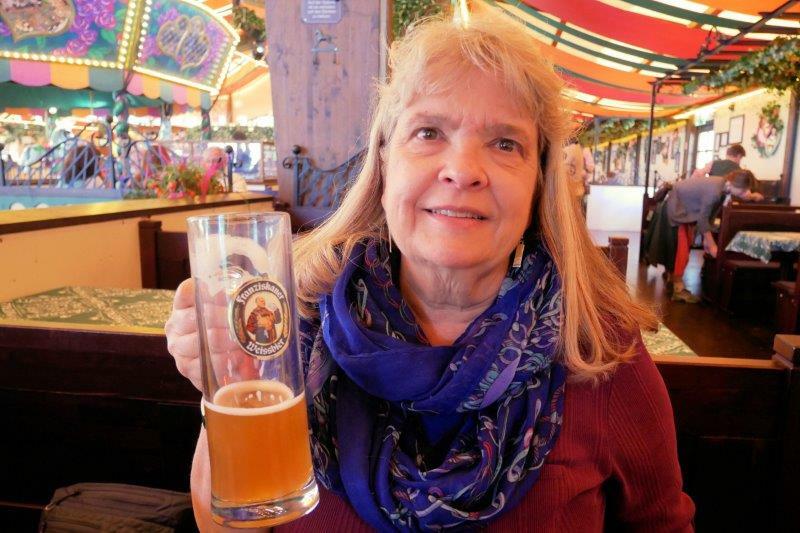 Susan and I went over early to the Oktoberfest grounds (no, not to drink) to buy a souvenir stein that our lovely German friends were gracious enough to take back to Heidelberg for us. We will recover it, along with some clothes we leave in Heidelberg, next summer sometime. We, along with the girl selling the stein, about had a heart attack, when the opening bell screeched at 10 a.m. to announce that the grounds were officially open! This is the tent we had reservations for in the afternoon. 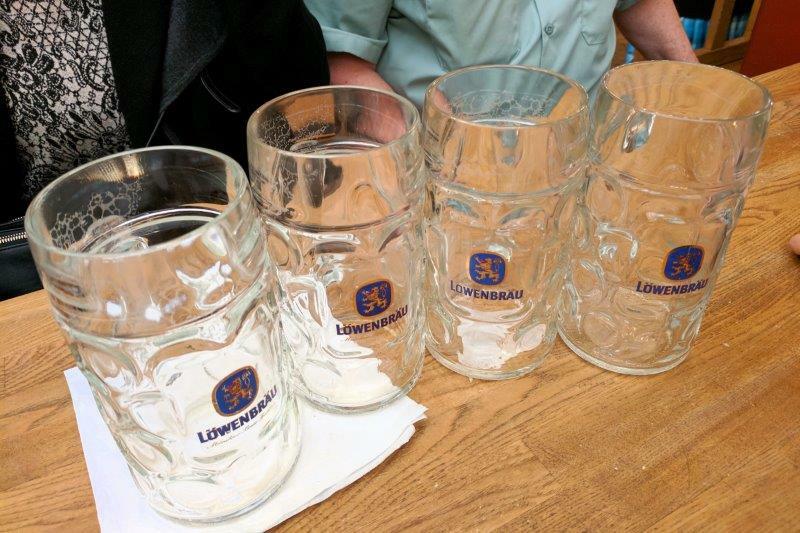 We had a reservation for 30 people at the Pschorr Braurosl tent. Due to unforeseen issues, some people couldn’t make it. We had 22 people at our 3 tables – 15 Americans and 7 Germans. That meant we had an additional 8 * 2 = 16 beer tickets to use. We wondered if they would go to waste but any guesses if they went to waste? 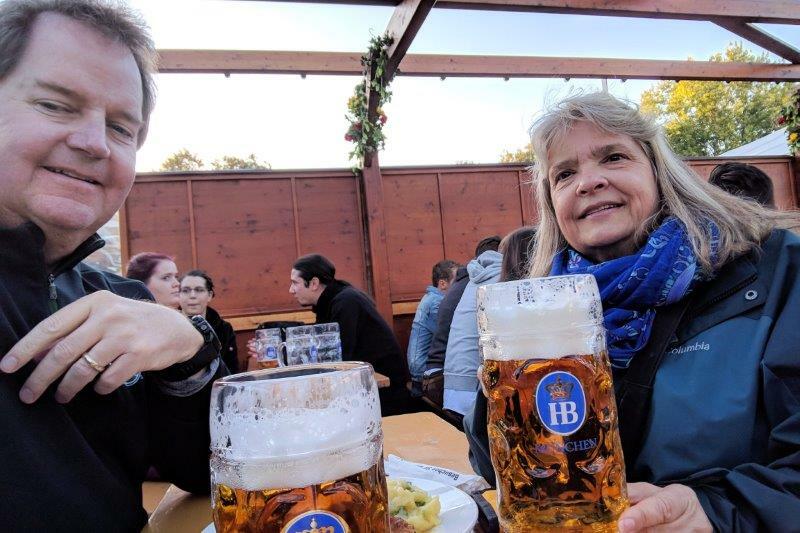 We added a couple of extra people the night before at Schneider Weiss, Dan & Debbie from Minnesota, to join us at Oktoberfest. It was easy to pick them up, we just mentioned beer! OK, they are friends of Chris and Janet and we knew they’d join us but they were new to our group. We (the Americans) arrived at the tent at 11:30 and found our table with no problem. The only issue we ran into that day was our 3 tables were spilt between 2 waitresses. One waitress had 2 tables and the other waitress had 1 table. John committed a mortal sin and ordered his first beer from waitress number 1 and his second beer from waitress number 2. John was summarily berated, spanked, and given a wedgie by waitress #1. OK, I am a bit foggy on the wedgie. We were then told to order only from the table where you ordered your first beer. Fear of the wedgie, we didn’t make the same mistake as John. Our German friends, led by Bettina, made it to the tent around 11:45. What took them so long? 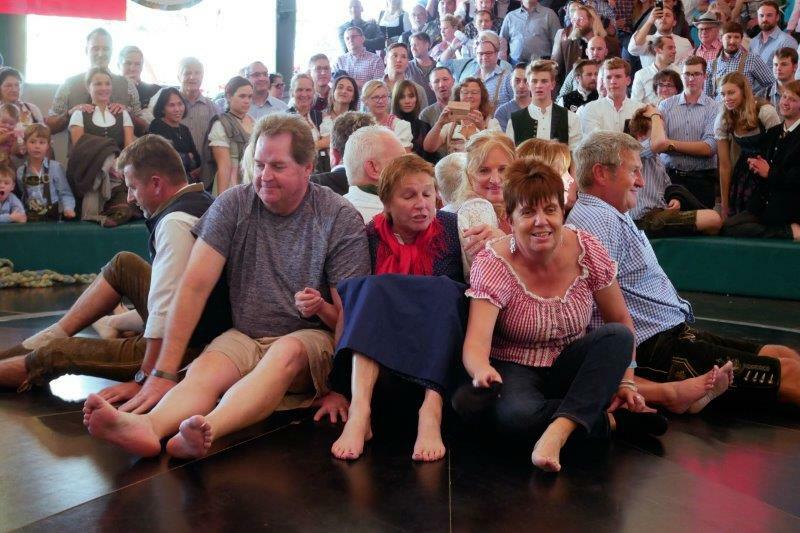 They had been in the Lowenbrau tent queuing up! The roar of the Lion was the giveaway they were in the wrong tent. At 11:30, BTW, the drinking hadn’t started! Not for us at least, but maybe the Germans started early!?! If you are keeping score, it’s Americans 1 – Germans 0. Being the afternoon session, the tent starts off quiet and is not very crowded. As the afternoon wore on, the tent started to get busier and noisier. People in our group moved around to different tables so people had a chance to speak with everyone during the session and spend time with each other. No fights started in the tent, so that was good. As the session got later in the afternoon, people started ordering their chickens (Remember, you get a ½ chicken with your voucher). Here’s how they cook all those chickens. This was one of maybe 6 stations that just cooked chickens. Lots of chickens needed to be roasted. People also consumed more beer as the day progressed – shocker. 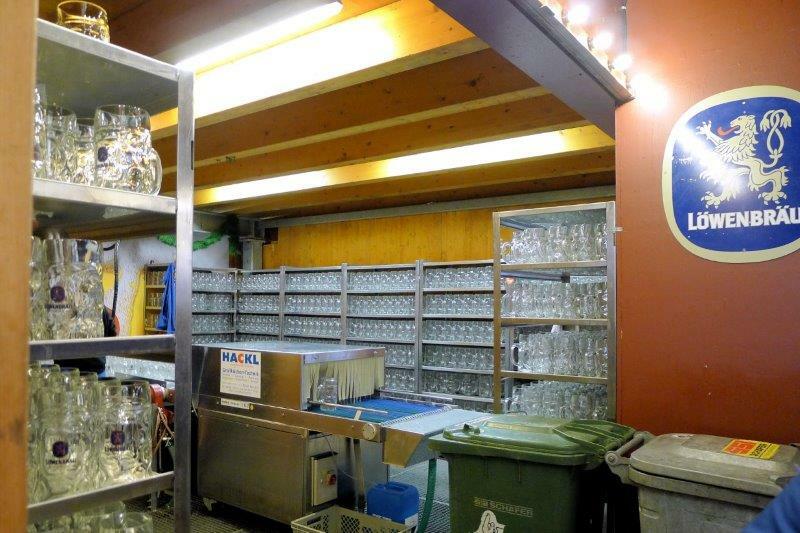 The operation to clean, fill, and serve the beer is impressive. Again, this was just one of several stations in the tent. Justin wearing one of the hats. Thanks, Justin, for the hat. I got a lot of compliments on the hat. Franziska (Bettina’s daughter) bought some tobacco snuff and peppermint snuff; as they say, when in Rome…. I tried both and can attest both open your sinuses. I did have peppermint several more times that day from unknown Germans. Fast forward to the end of the session … you can guess a lot of beer was consumed during the afternoon. Justin commented that he knew, now, how all the people we had seen over the last several nights who were passed out, were puking, or were so drunk they could barely stand could reach that state. 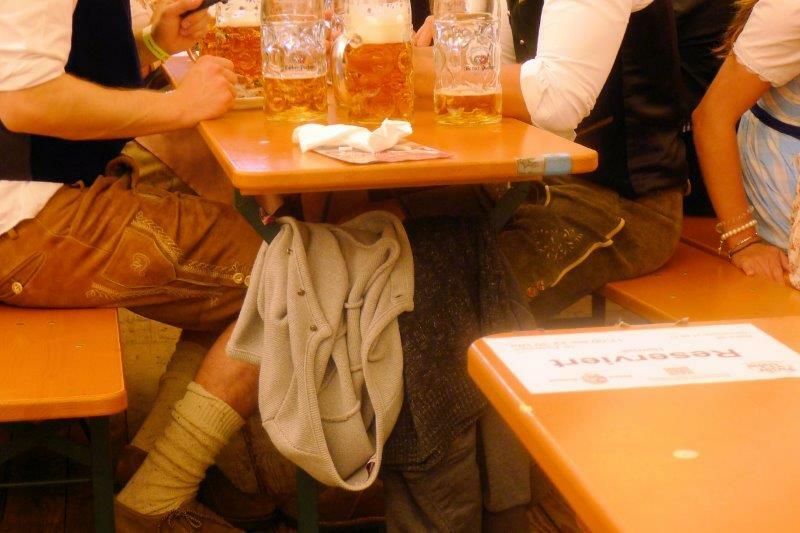 He said “if you were at Oktoberfest from beginning to end, you could be pretty drunk”. Enough said. The trumpeter played his song to conclude the session and at that point people scattered like cockroaches when the light comes on. We didn’t see most of our group until the next morning. We aren’t sure what happened. 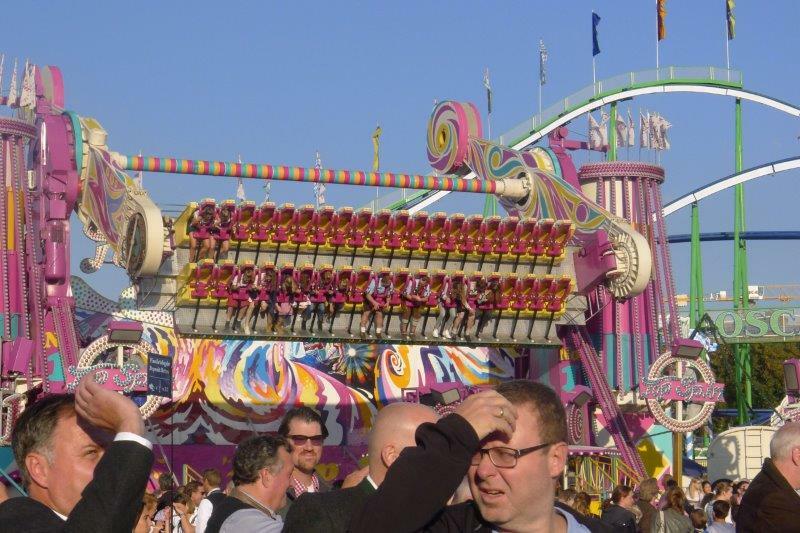 We ended up with our German friends and going to the carnival part of the Oktoberfest – great! Here’s the list of games I played and the results (Remember, this is my memory of Oktoberfest). Rang that bell – I won a little horn. Not sure, I swear I hit the bell again. 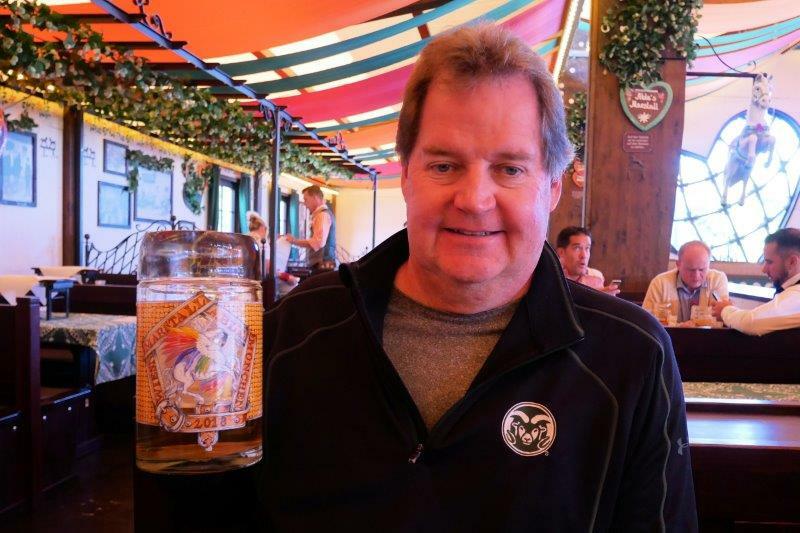 Shooting game – yep, my comment at the beginning about Germans and shooting after drinking – I had 12 shots. These guns shoot BB’s, but haven’t they seen Christmas Story and the Red Rider BB gun? Summary – I hit pieces of the target, but instead of moving on to the next target, I just kept shooting at the same target until it shattered. If you’re confused about why I was confused about the rules of the game, read the part above about drinking for 5½ hours. That said, I hit 10 at least parts of 10 of 12, if that counts. Franziska did the Strongman Game and hit the bell 3 times in a row! I think she even knocked the bell off on her third try. Her and her dad, Hermann, blasted most of the targets. BTW, they showed up later than everyone else to the Pschorr-Braurosl tent so they had an unfair advantage on me. 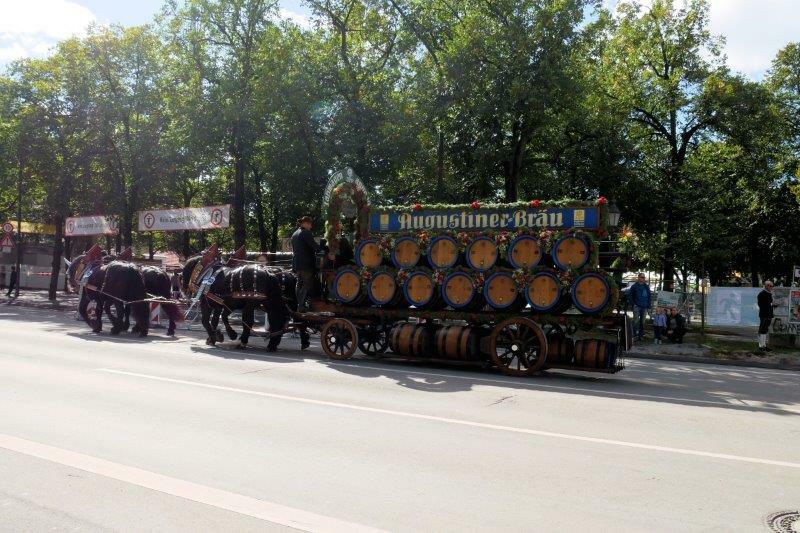 After games of chance our German friends did some “traditional German rides”. One was for 2 people where you stood in the cage and tried to get the cage to go in a circle. 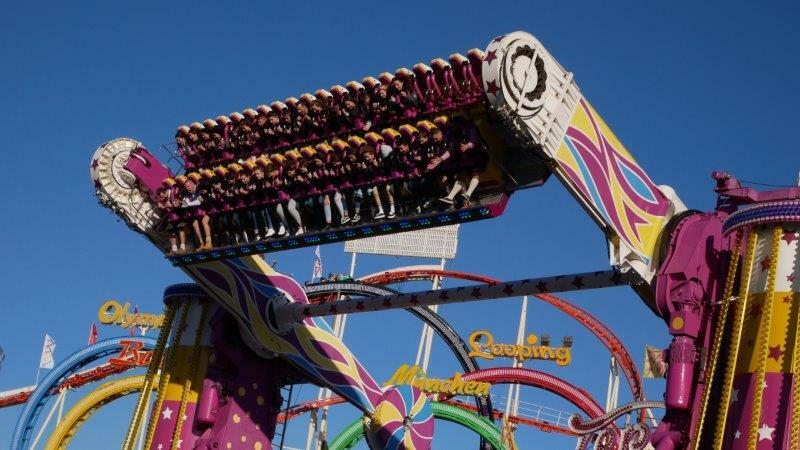 They also rode a ride that went in circles; see my FAQ page about vomit-inducing rides. 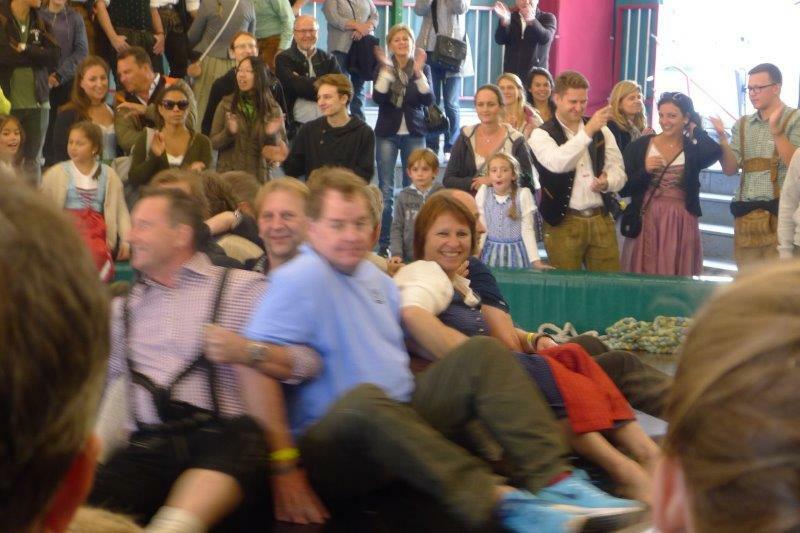 Mark and Bettina on the traditional German ride – slightly out of focus. I rode one “traditional German” ride. The only way to describe it is spinning top, upside down, without the point. The object is spin around and try to stay on as long as possible. The announcer called for people 45 and over to do the ride. Bettina and I both rode it. I didn’t win that one, but didn’t vomit either. So, a win in my book! Since everyone was getting a bit parched by this time, we all stopped at the Champagne booth to have a glass of bubbly. At that point our German friends left and we met up with John, Deanna, Hans, his cousin Mark, and Mark’s friends at a wine tent. The wine tents are much smaller than a beer tent. Weinzelt seats 2,500 people. We had the table until 8:30 and had a little wine. Spaten tent toward the end of the evening in the middle of the week. At some point we got separated from Mark and his friends, but found them again at the Spaten tent around 9:00. Of course, we heard “Sweet Caroline” while we were there. The Spaten tent was fairly crowded and noisy. It was fun as we got to meet and talk with new German friends. We stayed there until it closed at 10:30. I bought a brat on the way back to the hotel and went to bed. 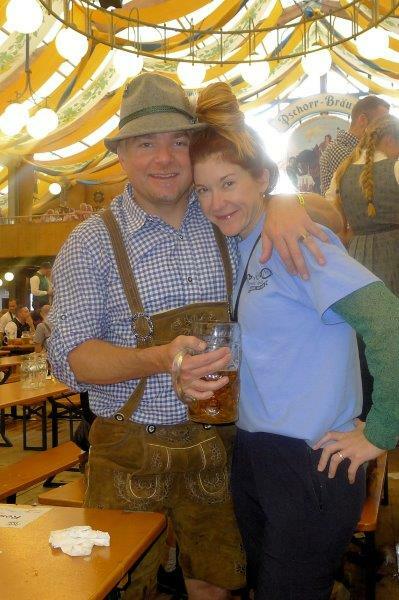 I must give Dave and Justin the award for Best spirit of Oktoberfest! BTW, no beer tickets went unused. 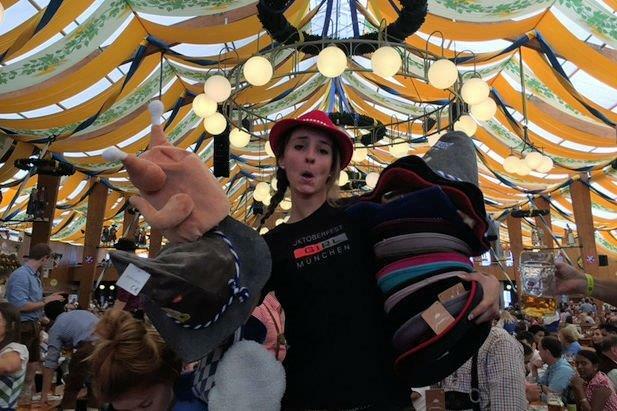 I want to thank everyone who came to Oktoberfest to celebrate the start of our Around the World adventure. It means everything to us to have such good friends to celebrate with. Thank you again! As Bettina says “same tent, same time next year”. Are you in!?! If you have any doubt about where to go, these signs are posted in the U-bahn and S-bahn and along the streets. 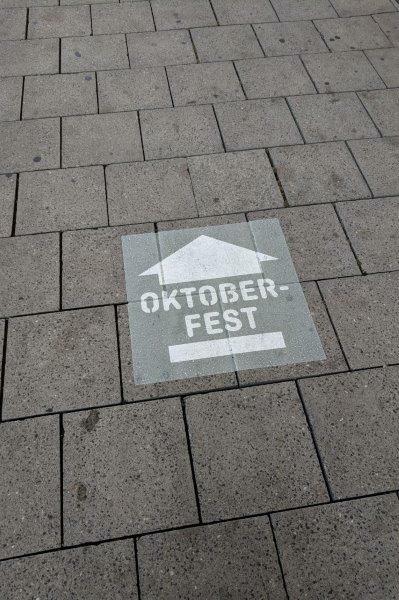 Follow the signs to Oktoberfest. 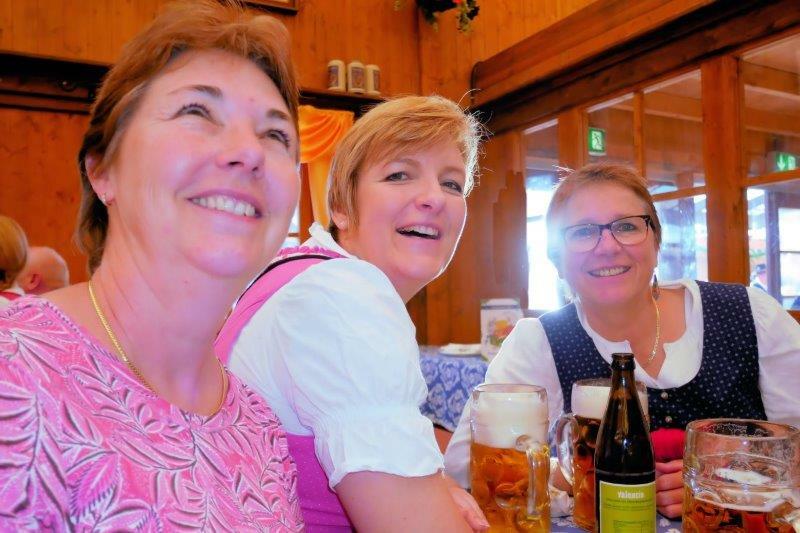 If you have “Ein Prosit” or “Sweet Caroline” running through your head for a few days, that means you attended the afternoon session (Ein Prosit) or the evening session (Sweet Caroline) at Oktoberfest. 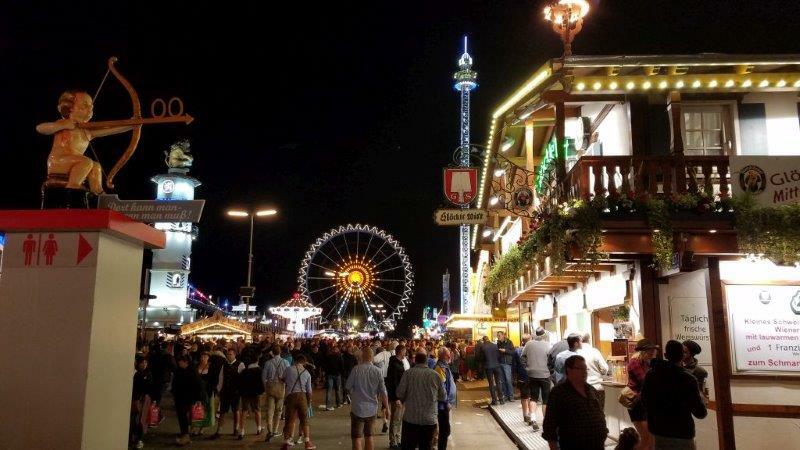 If you have both running through your head, you probably had too much to drink at Oktoberfest. 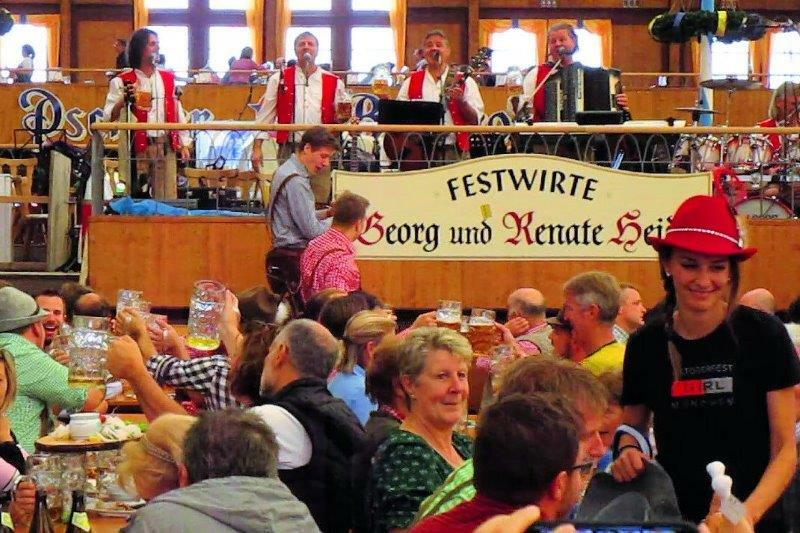 BTW, the bands don’t play “Ein Prosit” because they like it; they are required to play it every 15-20 minutes to increase the drinking of beer and, hence, the sale of beer. It works! The German band playing at Pschorr Braurosl all afternoon. Evening session in a tent. This is the floor of the tent as seen from a balcony. Another tent toward the end of the evening in the middle of the week. What is the difference between afternoon session and evening session ? You could say night and day. 😊 The afternoon session is what you would expect – calmer, quieter, and plenty of German music. The afternoon session starts at 11:30 a.m. and last until 4:45 p.m. During the afternoon session, it is easier to find a table, especially if you have a large group and no reservation (I will talk about table reservations later). You will see people of all ages in the tent from school children to senior citizens. If you worried that the afternoon session will be like watching paint dry, don’t worry. By 2 PM or so, most people are feeling no pain and singing to the songs regardless whether they know the words or not. 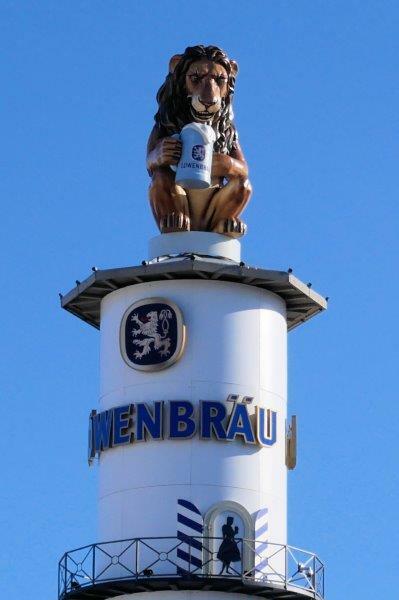 We saw one guy toss his lunch at 2 p.m. inside the Lowenbrau tent … sweet! The evening session is a complete flip from the afternoon. The session starts at 5:00 and last until 10:30 p.m. 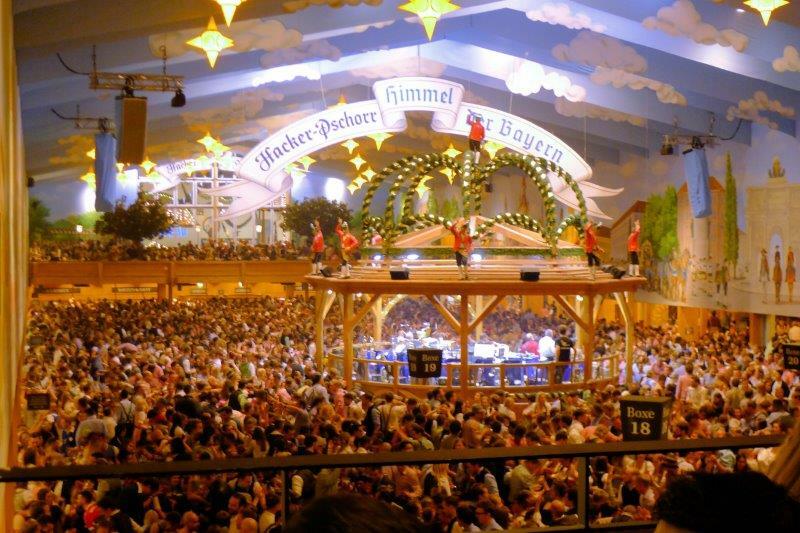 The tents close at 10:30 p.m. You will hear very few traditional German songs sang during the evening session. 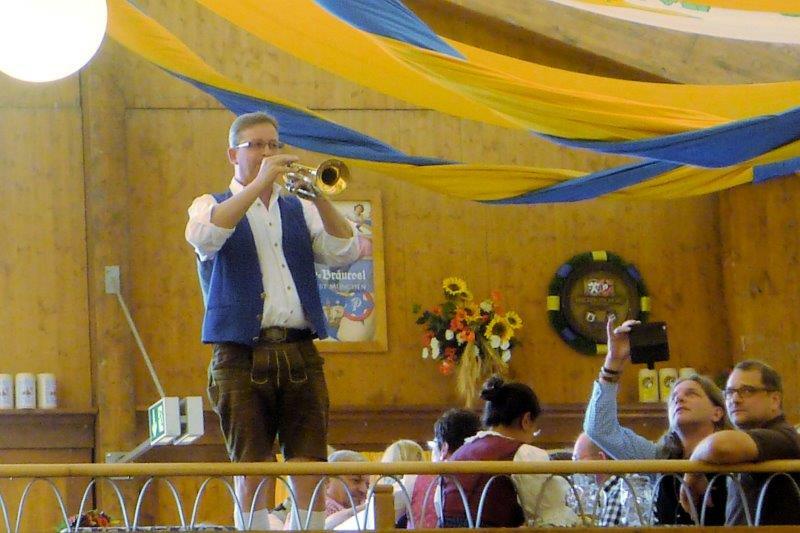 You will hear “Ein Prosit” once in a while, but no need to play it, everyone is drinking!!! Evening sessions can be very difficult to even get into the tent and these tents seat 6,000 – 10,000 people in EACH tent. There are 14 tents in total. They will “close” a tent when it hits capacity. As people leave, others can enter. Trying to find seating for a large group (i.e. >5) is tough. Did I tell that you need a seat to drink a beer? Yep, no seat, no beer. No self-service either. Tip: Get to the evening session early (e.g. 5) or late (9:00). If the main floor is packed, go upstairs and look for a table. If the weather is good, head outside to the tent’s beer garden. They seat another 3,000 – 5,000 people outside at each tent. Note: the evening sessions are VERY loud! The opening night crowd in a tent – more noise and people than one can imagine! 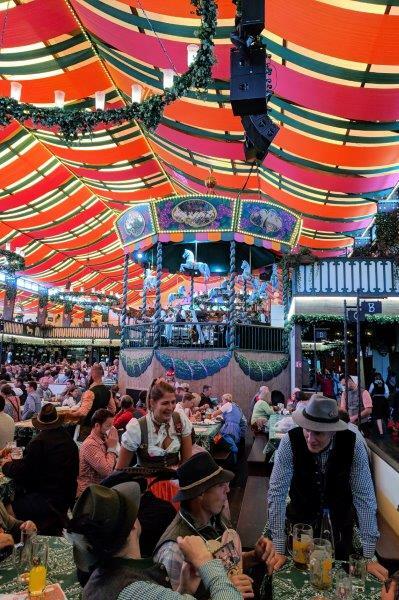 Do I need to pay to go to Oktoberfest or to get into a tent? No, admission is free for both. 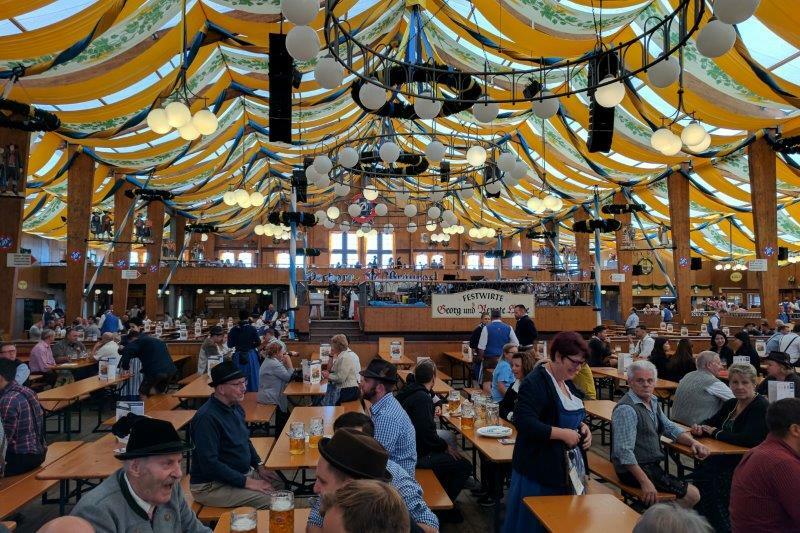 Are there just beer tents on the Oktoberfest grounds? 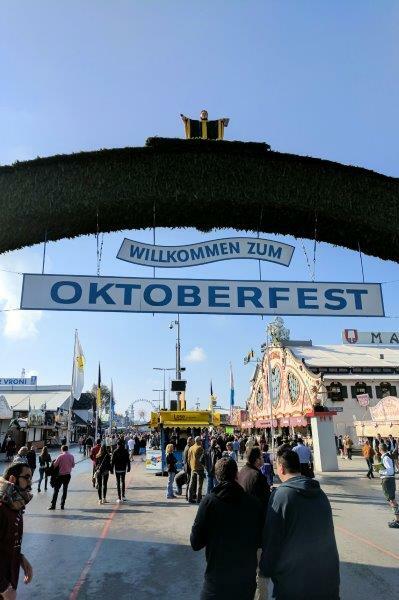 No, Oktoberfest grounds look like a State Fair. There are food vendors, games of chances, haunted houses and several rides that we termed “vomit inducing rides”. Think spinning around and upside down at high rates of speed. 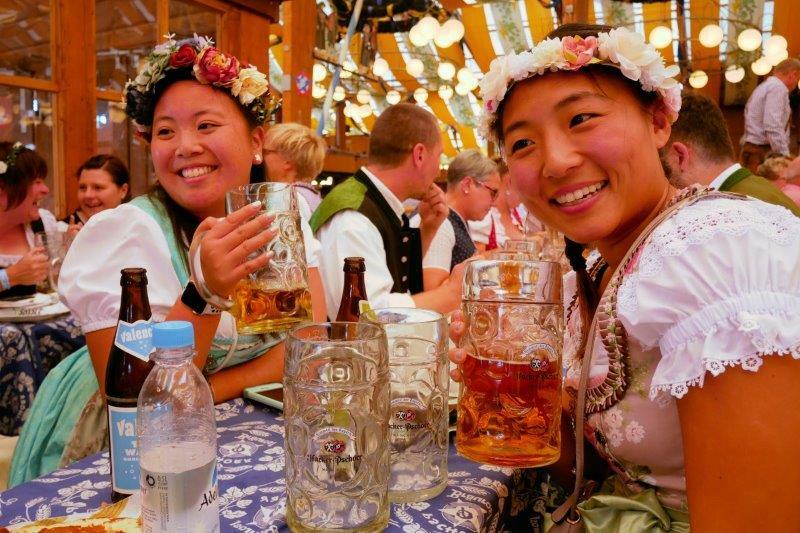 Can I only get beer at Oktoberfest? It depends. 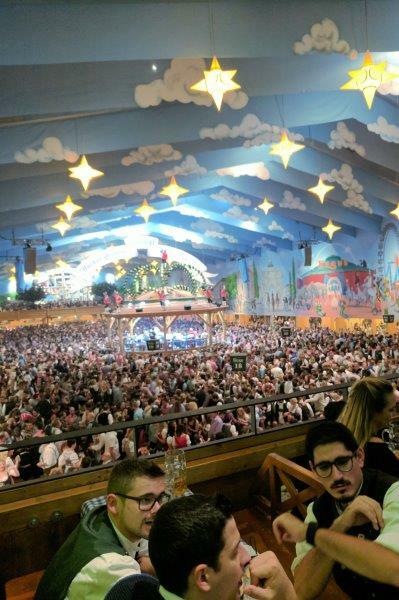 In a beer tent, only beer is served. 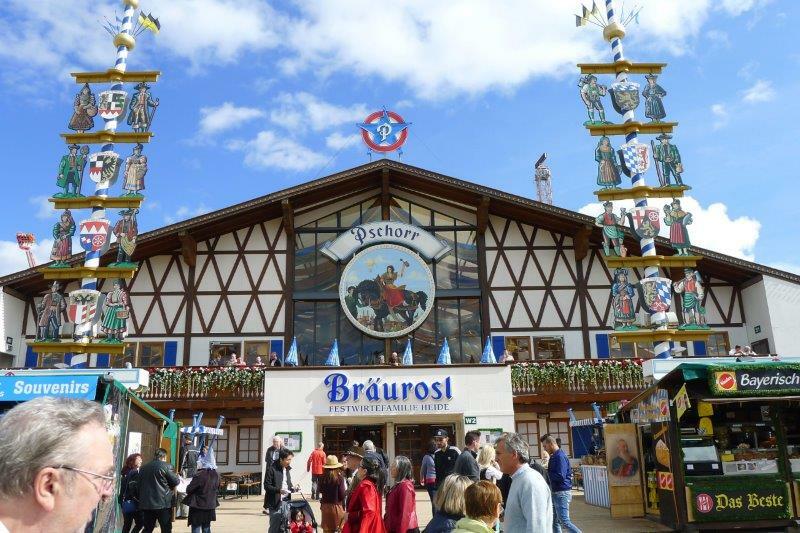 There are 2 wine tents located at Oktoberfest where you can get wine and beer. Besides beer or wine, you can get food. Food varies by the tent. Where did all the beer go? 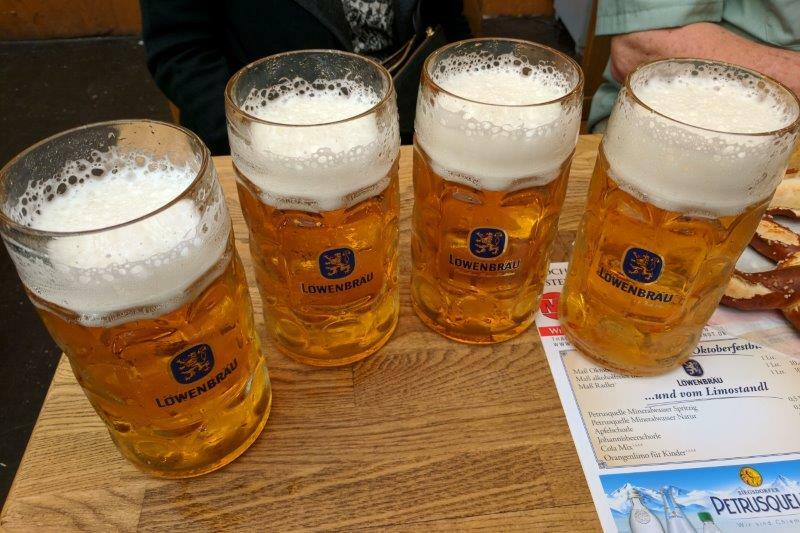 Is there only one size of beer? What kind of beer can I get? 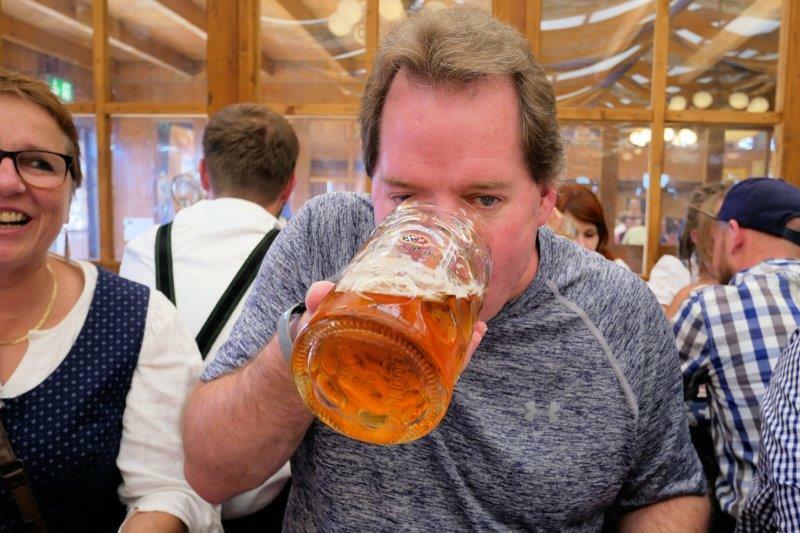 The beer is only served in a one liter mug. There’s only one kind of beer per tent, a fest beer. Each tent has their own beer. Can I eat at the tents? Yes, there are full menus at each tent. You better bone up on your German or have someone in your group who knows German. We never saw an English menu. Reservations are very hard to get, afternoon or evening session, especially if you are in a large group like us (30 people). Reservations are handled differently by each tent. Requests are submitted via letter, e-mail, etc. The tent(s) will let you know if you got a reservation sometime around May; again, this varies. Check individual tents for specific information. A reservation gets you an assigned table for a specific time and day. When you walk into the tent, you find the row number on your reservation, walk up the row and look for the name of your group at the end of the table. Tip: Reservations are made by the table size, most common is a table of 8 or 10. You MUST book an entire table. Does a reservation cost anything? No. 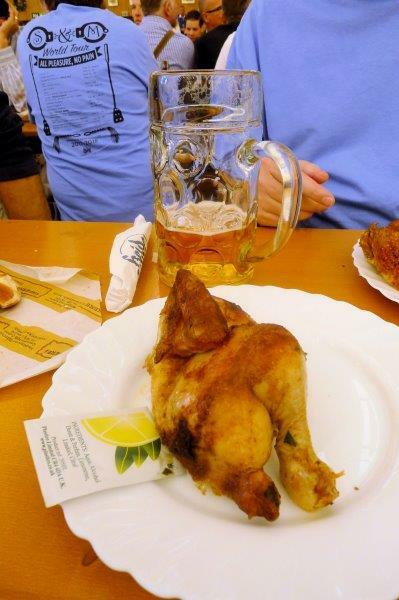 But, you are required to buy a voucher for each person that includes 2 – 1-liters of beer and a chicken. 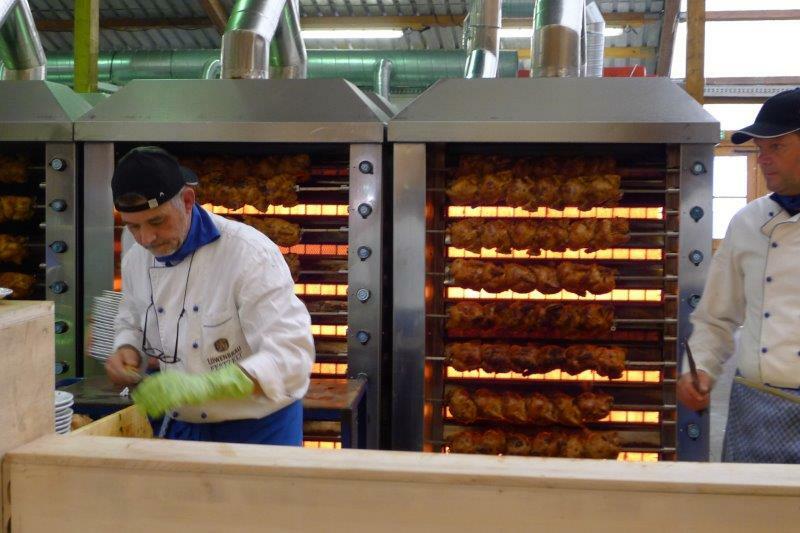 Tip: If you speak enough German, we understand you can change out the chicken. We don’t, so chicken it was! 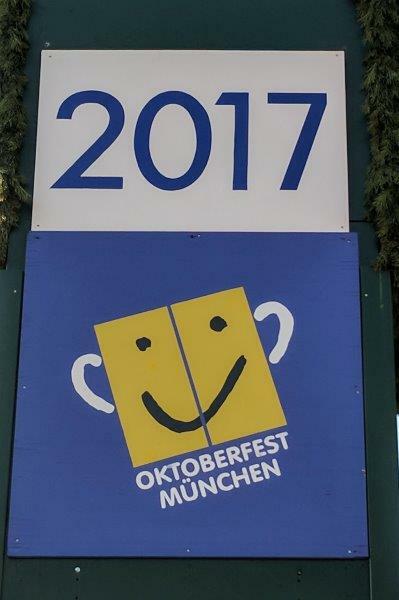 The official logo for Oktoberfest 2017 – steins, tshirts, post cards, magnets. 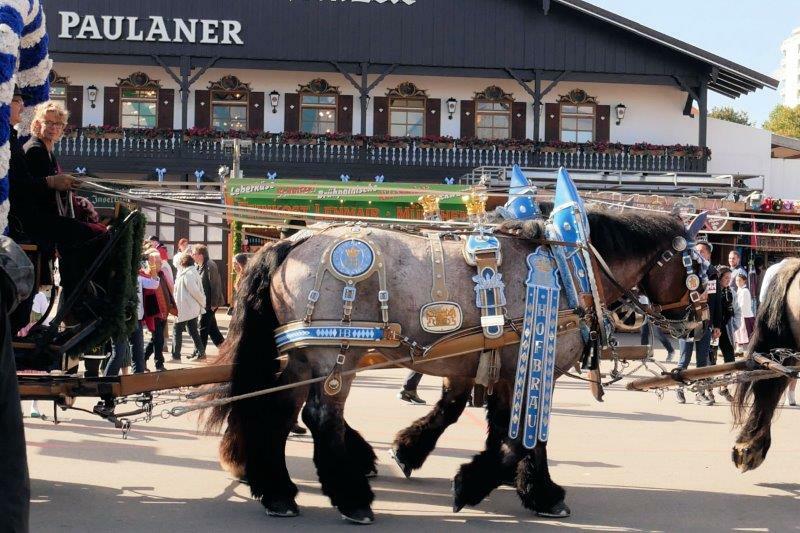 Oktoberfest is not just a time to have a few beers and some food. 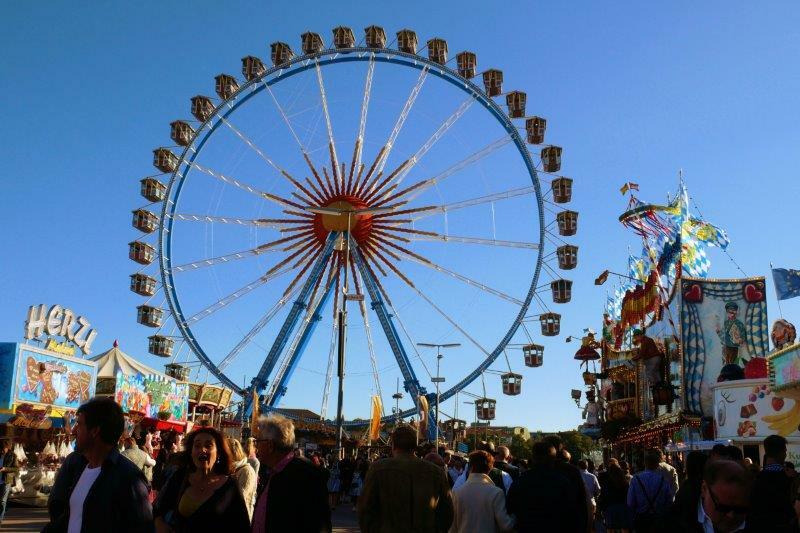 Oktoberfest is also a big fair – sort of like the Iowa State Fair without the cows, pigs, and chickens. 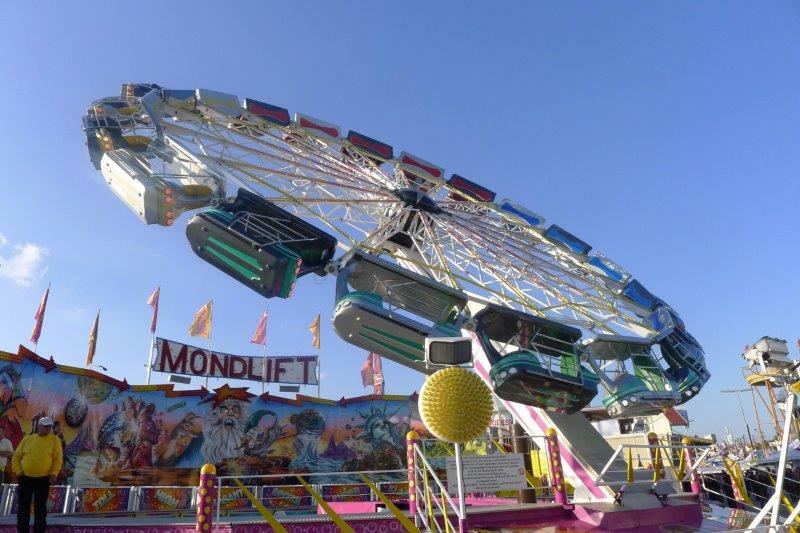 The rides included ones that go upside down, up high and around in circles. No one in our group tried any of them but the lines were long, including people who I’m sure were not really in any condition to spin or turn upside down. This ride spun in circles and each car went in circles, too. 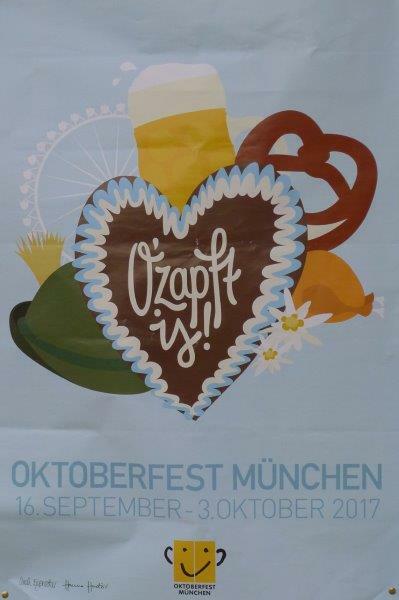 Oktoberfest has a post office set up for the event with its own cancellation stamp along with ATM machines since all purchases in the tents are cash only.